Duffy has scored 12 Premier Division goals for Dundalk this season. 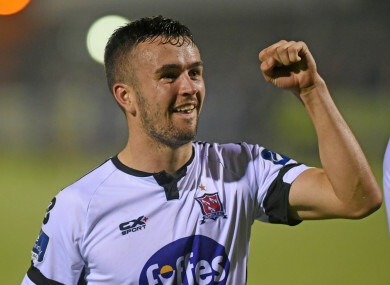 IN-FORM DUNDALK winger Michael Duffy has reaffirmed his desire to play for the Republic of Ireland, confirming that he had received a phone call from manager Martin O’Neill. The 24-year-old was speaking after his late strike earned Dundalk a crucial 1-0 victory away to Limerick on Friday, a result which extends the Lilywhites’ lead at the top of the table to six points following Cork City’s shock defeat at home to Sligo Rovers. Duffy has made 12 underage appearances for Northern Ireland and was called into Michael O’Neill’s senior squad for a World Cup qualifier in September 2016, but in recent weeks has admitted he hopes to make a switch to represent the Republic at senior level. Speaking after Friday’s victory, the former Celtic forward confirmed his intentions about a potential call-up. “I think I’m going to be committed to the Republic of Ireland now after getting a phone call from Martin,” Duffy said. “I got a call from him saying he wants me to join up with the squad when I can. I don’t know what needs to happen with clearance and stuff. The player has lit up the SSE Airtricity League in 2018, scoring 12 goals in 29 appearances for Dundalk so far this season. His form for Stephen Kenny’s side has fuelled rumour about a potential move away from Oriel Park at the end of this season. However the forward acknowledged that his focus was on helping Dundalk secure the Premier Division title, and not on a potential move abroad. Martin O’Neill has praised Duffy’s performances in the League of Ireland this year, outlining the winger’s ability to beat defenders. “I’ve got a lot of time for him,” the manager told RTE Sport. “I think he’s an exceptionally talented player. It didn’t happen for him at Celtic. He wouldn’t be the first young player to have gone over there and not come through. Email “'I think I'm going to be committed to the Republic of Ireland now after getting a phone call from Martin'”. Feedback on “'I think I'm going to be committed to the Republic of Ireland now after getting a phone call from Martin'”.